This article was orginally published on March 15, 2011. I’ve been watching America’s Next Great Restaurant, a show where contests compete by pitching their ideas for a new restaurant chain. The winner gets funded by Bobby Flay, Steve Ells (the founder of Chipotle) and others who will help the lucky person open a three-restaurant chain with the promise of more. This first logo is for a restaurant concept called MeltWorks, an upscale grilled cheese restaurant. Basically the idea is to take the cheesy deliciousness of a traditional sandwich and give it some pep and variety by adding various gourmet ingredients. The judges/investors didn’t like the logo because of the cog that replaced the “o” in the word works didn’t convey “grilled cheese” to them. They wanted something food-related instead of a piece of machinery dripping goo. 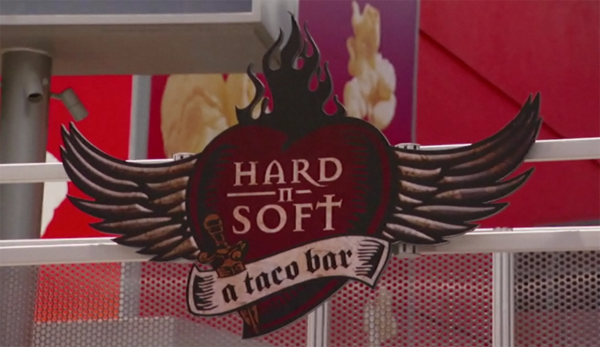 A second logo they really didn’t like came from a taco bar concept called Hard ‘N Soft. The logo had a great grungy feel—almost tattoo-like—that fit the attitude of the proposed business. Again, the judges hated it. The logo was probably their least favorite. The reasoning was similar, too. They didn’t see anything that made them literally think food. Based on these two examples from America’s Next Great Restaurant I completely disagree with what the judges say make a good logo design. So here are some logo principles I think would serve them better and they apply to any organization whether it’s a business or a church. Logos don’t have to be literal. A sandwich store doesn’t need to have a piece of bologna in the logo. Church logos don’t necessarily have to include a cross. There’s a whole bunch of great logos out there that are abstract or artistic. What does the Nike swoosh have to do with literally working out? What do the golden arches have to do with hamburgers? Even simple, successful logos like those of Target and Apple have nothing to do with their actual product. They’re literal to the company name, but not what they’re selling. Logos have a personality. Successful logos are ones that accurately reflect a brand. They show your personality and visualize your style. If someone looks at your logo and then has interaction with you, there’s shouldn’t be a disconnect between the two. It should make sense. The guy with the Hard ‘N Soft taco bar concept has a clear personality that’s reflected by his restaurant. The logo showed that personality. If the logo matches the experience inside the restaurant, the company has successful branding. Creating a logo is a subjective process, so have a brand ambassador. Whenever a logo’s being made, there are going to be a lot of opinions. Everyone has their own design esthetic. So make sure you have someone who really understands the brand you’re creating a logo for. Do they get the personality? Do they know what the experience is like interacting with your organization? That person should be a gatekeeper in saying what’s true to the brand and what isn’t. great logo.. it shows the personality of the owner.. i just hope they serve great food..
Great points about logo design in this article. Thanks! Great article - nothing annoys me more than a literal logo where it’s not needed!